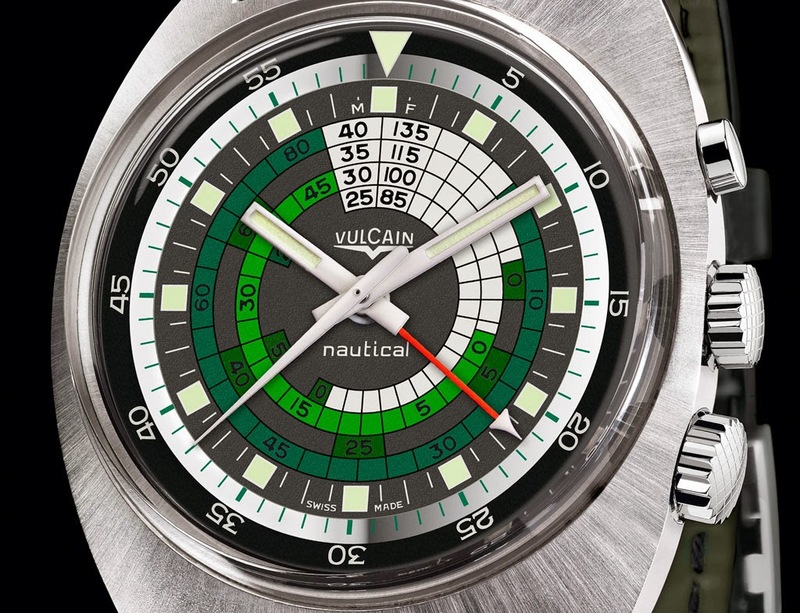 For the Vulcain Trophy 2014, a series of yachting races taking place on the Geneva Lake sponsored by the Le Locle-based watchmaker, Vulcain presented a third version of the Nautical Seventies diving watch. The Nautical Seventies Green follows the Orange and the Blue variants, both released in 2013 as Limited Editions. 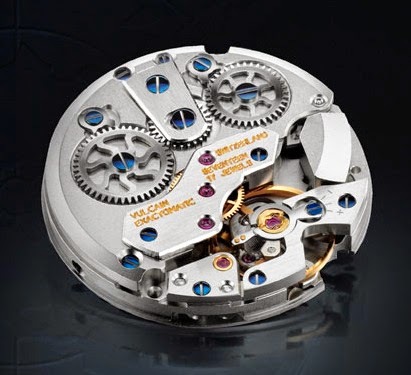 The model is water resistant to 300 metres / 990 feet and features the hand-wound Cricket V-10 movement with a mechanical alarm which is audible even underwater. The alarm can sound for up to 20 seconds thanks to a dedicated barrel that supplies the energy to power the function. A second barrel delivers the energy for the time functions. Beating at 18,000 vibrations per hour, the Cricket V-10 offers a power reserve of 42 hours. The 42 mm stainless steel case, alternating satin-brushed and polished finishes, acts as a resonance chamber for the alarm, whose sound is further amplified by the hesalite glass. 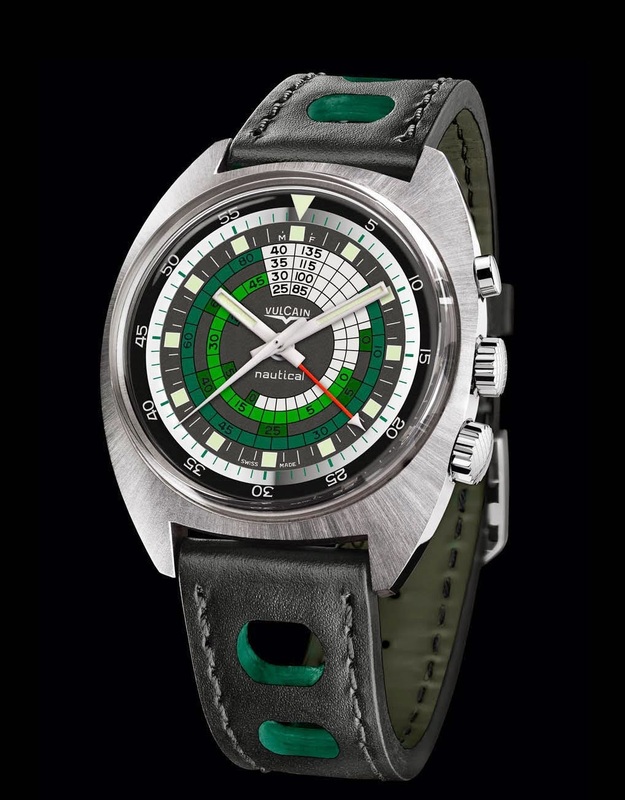 The dial is characterised by the central decompression tables in green and the 60-minute inner bezel that can be adjusted using the screwdown crown at 4 o’clock. The hands and the square hour-markers offer excellent readability, even in the dark, thanks to the generous use of luminescent material. The Nautical Seventies Vulcain Tropy 2014 (ref. 100159A97.BAC116) is equipped with a water-repellent leather strap with green lining, a perfect match for the watch. 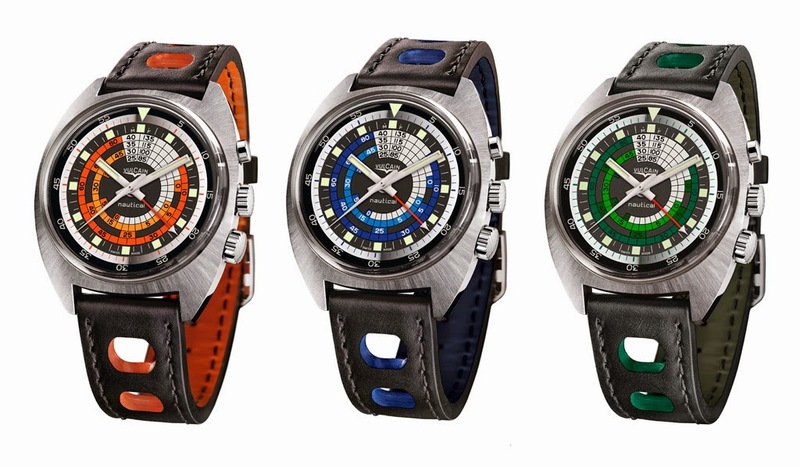 For the Vulcain Trophy 2014, a series of yachting races taking place on the Geneva Lake whose main sponsor is the Le Locle-based watchmaker, Vulcain presented a third version of the Nautical Seventies diving watch. The Nautical Seventies Green follows the Orange and the Blue variants, both released in 2013 as Limited Editions. Nautical Seventies Vulcain Tropy 2014 (ref. 100159A97.BAC116).